The Gator Band performing its children’s hospital tribute. 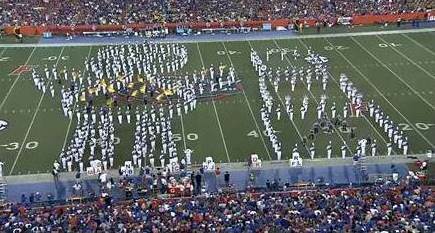 At the University of Florida versus LSU football game in October, our superb Child Life program worked with the marching band to make a spectacular halftime show. Pediatric patients were highlighted and asked to share their favorite song, which the band performed live on stage. To top it off, Nate Ferrell, Florida’s CMN Champion, served as a gust conductor of the Gator Band, “directing” the last sequence. Katrina Gomez with her two sons (Wyatt is on the left) poses for a photo with Dr. Weiss and Judy Angley during the check presentation on Nov. 10. When Katrina Gomez went into labor with her second child at 29 weeks, she was surprised to say the least. She didn’t have any complications during her first pregnancy so she wasn’t expecting a premature birth. Katrina went into labor on February 13, 2012 in Ocala and was transported to UF Health Shands Hospital. When baby Wyatt was born his prognosis wasn’t encouraging, as he’d experienced a lack of oxygen during delivery. If he survived, he was expected to have brain injury. Wyatt was treated in the UF Health Shands Children’s Hospital Neonatal Intensive Care Unit for nearly 11 weeks and he was able to go home one day after his due date on April 26. The goal was for him to leave the hospital healthy, and it was achieved. Thanks to Wyatt’s strong-willed determination and the prompt actions of the NICU physicians, nurses and support staff, Wyatt doesn’t have any lasting effects of his premature birth except for asthma. 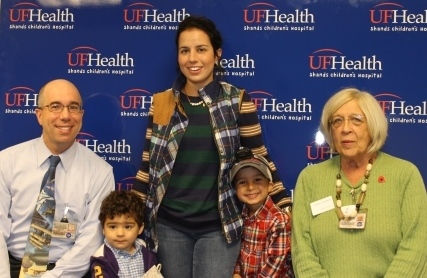 During their time in the hospital, the Gomez family formed a strong bond with Michael Weiss, M.D., a neonatologist who leads the Florida Neonatal Neurologic Network. The FN3 group’s mission is to provide state-of-the-art care for newborn babies with brain injuries, specifically Hypoxic-Ischemic Encephalopathy, and to collect research and develop future therapies to improve long-term outcomes. The cooling therapy technique, which prevents brain damage by lowering the body temperature of babies, is a major treatment for HIE. Research shows that one in 8 newborns treated with the cooling blanket technology have a positive response. Dr. Weiss is and his team are conducting research to develop alternative therapies to help those babies who don’t react to the cooling therapy. Katrina wanted to help with this research. She decided to host the “Lasso for Little Ones” event in Trenton, FL. It had two goals: 1) to raise awareness of the number of people affected by prematurity and 2) fundraise for two groups who helped her family through her previous experiences: FN3 and the March of Dimes. The community event was a success, raising nearly $4,000 with more than 100 people in attendance. It included children’s activities, food and entertainment, and even a goat roping activity. And Katrina hopes to make it a yearly event, expanding it in future years. Katrina donated the proceeds to FN3 and the March of Dimes on Nov. 10 in support of the efforts underway by both organizations to help with prematurity.